This year we will do something different! Instead of musical items interspersed with readings, the whole of the programme will be a performance of Haydn's Mass No 10, the Paukenmesse (Missa in Tempore Belli/Mass in Time of War/Kettledrum Mass). 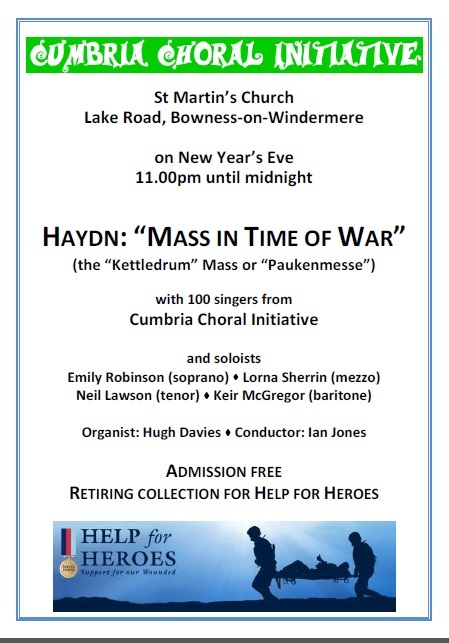 For the second year this will be held at St Martin's Church, Bowness-on-Windermere, with a rehearsal from 7.00-8.30pm and 8.45-9.45pm, when a Jacob's Join Supper will be served, and the performance will start at 11.00pm. The concert will this year raise funds for Help for Heroes. Click here for a downloadable letter and application form.